How did you decide to run the cooling water? I'm wondering if I can tee in with my salt water wash down? Starboard bow the current small strainer is up high but primes okay with the wash down pump. If I put the larger strainer in and tee off after with the AC pump mounted below the wash down pump, would it prine after priming the wash down? The idea being to make strainer maintenance easier while reducing the number of below wl throughulls. And keeping them in the walled off bow compartment. I installed a trough hull under the fridge. I'm going to raise the sill on the compartment just a few inches, which will bring it above the water line and make this into a bullheaded compartment, like that starboard bow. It is also an easy-access spot for the filter. It did add one hole, but I really wanted easy access. In my experience in industry and ALL of the advise from Dometic and Webasco, the strainer and pump should be below the water line AND the flow must be upwards without loops. 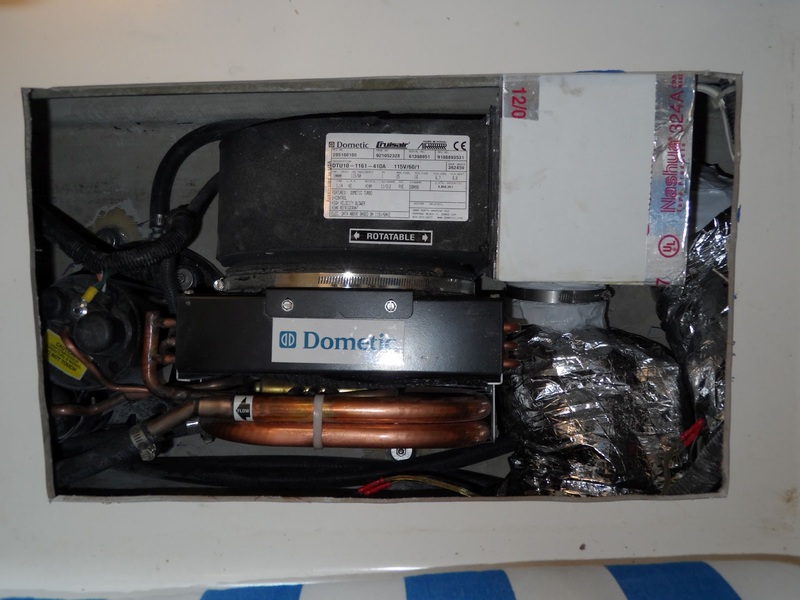 The return will be in the same compartment and the condensate will go to the galley sink. amytom wrote: ...What is the thickness and make-up of the bridge deck area? Is it divinicel core as above water line or solid as at the waterline? Also, how thick? If cored I will have to drill, bent nail, refill then mount the rubber feet. How long of screws etc? For ducting I'm thinking of a four inch duct to the galley on the aft side above the stove that can cool the galley or angle back to the port cabin. A two inch duct in the head, a two inch duct to each side of the forward seat back feeding right into the fans. These three two inch ducts can pass around the carbon beam behind the power outlet above the sink without cutting into the cabinet. All the outlets have dampers to reduce flow to divert the air to other outlets. a. Did you drill, or did you try the glue-on studs? b. That doesn't seem like nearly enough duct area for a 20K (I don't know the brand, but I would think about 100-120 in2 is required, meaning about 10 x 4-inch vents. My 10K calls for 5 x 4" vents. Big intake vents too. Haven't had a chance to look at it again. Been working too much. Will probably epoxy down some pads in the corners but need to be careful of going too high or the seat board will be resting on the evap coil. On the Dometic unit the hold-downs are on the outside of the unit and thus pads would not elevate the unit. Not sure what you are working with. 1. The glue-on studs for hold downs worked great. Duckworks. 2. Only draws ~ 7A running. 4. Only lost 2 lockers (under fridg, one salon locker). No cutting into cabinet space. Awesome! Where did you get the insulated ducts? Any pictures of them? Home Depot has the duct, as do chandleries for 2-3x the price. My intake grills are HD, but the discharges are Webasco. The plenums and splitters were home built. thinwater wrote: I installed a trough hull under the fridge. I'm going to raise the sill on the compartment just a few inches, which will bring it above the water line and make this into a bullheaded compartment, like that starboard bow. It is also an easy-access spot for the filter. It did add one hole, but I really wanted easy access. Congrats on finishing the project. With respect to the above, this was my biggest challenge when I did this. Were you able to locate the strainer and the pump in such a way that everything is below the water line and runs uphill. If so, I'd love to see a picture or two of this compartment under the fridge. Thanks. As a follow up to this, I was chatting with the owner of a very shallow hulled boat and when AC came up, I told him about the challenge of making sure the strainer and pump were below water line. He said he was going to go with a pump that was self priming and mount it near the AC unit. I did not know they existed. But here it is: http://www.yachtsupplydepot.com/fishing ... 75898.html (googling it, you can see the manufacturer's page). It's more than 2x the price of the CalPump MS580 that I have but it appears it could be mounted anywhere. Not sure if the strainer would need to be below waterline. Maybe not. * That capacity must match. Dometic informed me that mismatched pump sizes are a leading cause of failure; so small is obvious, but too large wears the tubes out. Very bad. * Small self-priming pumps are rare. The design does not wok so well below a certain size. The illustrated pump is ~ 4x too big. * They will self prime, but including the strainer is pushing your luck. The more volume of air they have to pass, the less reliable. * Less energy efficient. Does not matter for this. * It won't self prime if the seal begins to leak. * It won't self-prime if the water has time to evaporate or gets shaken out of the sump. It is ALWAYS better to get flooded suction on pumps. You should be able to get the pump low enough. Yes, I was able to get it all below the waterline and flowing uphill. Unfortunately, all the pics are for Good Old Boat Magazine. Good info, Drew. Makes sense. Doing a little pre-planning. 1999 36. What is the space available under the saloon (salon, to save the debate) - dimensions? I am shopping based on the most that will fit as we are in the Gulf. Honestly, you better measure your boat. They vary a little and the fit will be tight. In my case, I trimmed the opening a little. Additionally, You need to work out where the ducts are going to run before you settle on a location. That is actually by FAR the most difficult part of the job IMO. * First, inlet and outlet duct locations. * Finally, water inlet, power etc. Still critical, but more flexible. Does your 1999 36 have the house batteries in the port salon or outside in the cockpit?